As per IRDA guideline from 1st October 2016, onwards insurance policy fulfilling certain aspects will be issued in e-insurance account only. It will be mandatory to hold e-insurance account with an insurance repository by the policyholder. This means just like Demat account you will have another account called as e-insurance account. The e-insurance account will be used to hold multiple insurance policies in electronic format. This account is also known as eIA account. Pure Term plan, personal accident and travel policy and all general insurance policy with sum assured greater than 10 Lac will be issued electronically. All retail motor insurance policies and individual overseas travel insurance policy irrespective of sum assured will be issued electronically. Health insurance policy with sum assured greater than 5 lac will be issued electronically. ULIP and Endowment plan with sum assured greater than 1 lac will be issued in electronic format. Pure Term plan, ULIP, Endowment plan, pension policies, return of premium policy and health insurance policy with premium amount equal or greater than Rs. 10,000 will be issued in electronic format. General Insurance policy and domestic travel policy with premium amount equal or greater than Rs.5000 shall be issued electronically. In order to issue e-policy you need to open e-insurance account. You can open your e-insurance account easily by contacting an insurance repository. IRDA has approved four different institutes as an insurance repository. 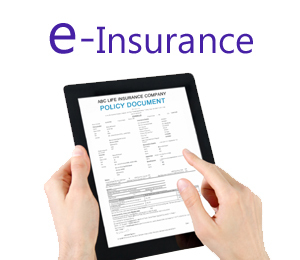 Step -1 – Download e-insurance account (eIA) opening form from respective insurance repository. Alternatively, you can fill e-insurance account opening form online. Step -2 – Enclose KYC documents such as PAN card, Aaadhar card, address proof and identity proof along with your application form. Step-3 – Submit e-insurance account opening form along with KYC documents to authorized center of insurance repository. Step-4 – Authorized person from center will verify your application and KYC documents along with original. Step-5 – Insurance repository will open your e-insurance account and communicate following information to account holder. How to convert your insurance policy to e-policy? Once your e-insurance account is opened you can convert your old physical policy to electronic format. Please ensure that separate Policy Conversion Forms are filled for insurance policies of different insurance companies. Submit policy conversion form to nearest insurance policy office or insurance repository center. Alternatively you can also email/courier this form. No need to submit original policy document along with this form. On conversion you will get SMS about policy credited in your e-insurance account. All insurance policies are available at a single place in the electronic format. Easy to access policy detail anytime anywhere using internet. Premium alert and insurance payment online. No fees/charges applicable to the account holder. Better monitoring of policy to prevent laps of policy. No worry about loss of policy document. Cost reduction and increase in reach through insurance repository touch points. Reduction in activity and cost related to printing and dispatching a policy. Easy manageability and search due to electronic record. Work load of agent will reduce as they need to remember premium paying details of customer. As premium can be paid online they need not to visit physically for premium payments. Do you think initiative of converting policy from physical form to electronic will be beneficial? « How to start teaching online to make passive income? Good info. Couple of queries. 1. Each combination of policy holders should have independent account? 2. Is KYC of SEBI not acceptable by these depositories of IRDA? Again one has to go for KYC process? 3. Are there no opening or maintenance charges for these eIA accounts? Answer of your queries are given below. (1) Yes one independent account is required for each policy holder. (2) No KYC of SEBI is not acceptable. You need to undergo KYC again while opening e-insurance account. (3) No fees/charges applicable. This service is absolutely free.